Pretty cool huh? 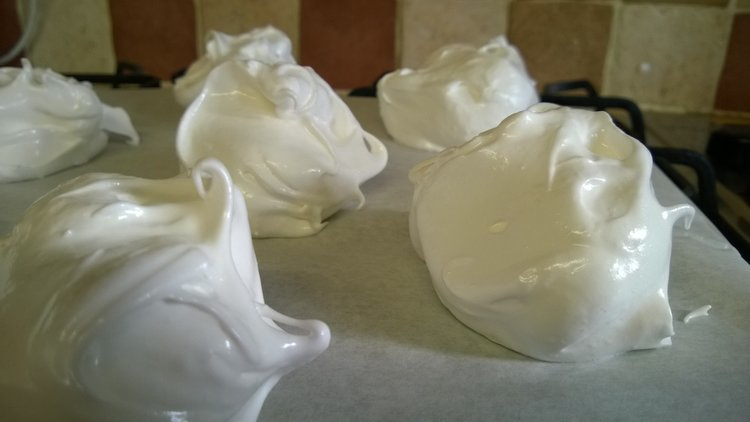 Now it may seem a bit big-headed of me to have named these meringues “perfect” but what can I say, they were! 1) Ensure your bowl and mixing blades are completely grease-free or you will have trouble. Beat the egg whites with an electric mixer until they form stiff peaks. 2) Mix the cream of tartar into the sugar, then one dessertspoon at at time add the sugar into the eggs, beating on low speed each time until just combined. Your final mixture should be thick and glossy. 3) Spoon dollops of the mixture onto a baking sheet lined with baking paper. This mixture makes 10. 4) Cook them at 70C/150F for 6 hours. I wasn’t overly thrilled about leaving my oven on for 6 hours, and there are other methods of cooking them that involves having the oven on for less time, but I had heard this was the best way, so I went for it this time. The long slow way is more a process of drying them out than anything, and they keep their whiteness this way. 5) Remove carefully and cool them on a rack. 6) Whisk the cream until desired thickness is achieved. Add the jam and whisk until combined. 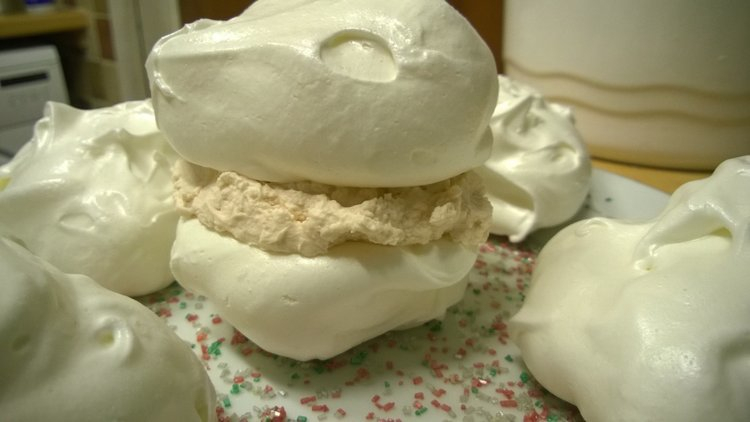 Sandwich the cooled meringues with the cream. This actually makes more strawberry cream than you will need for the meringues, so you will be forced to keep some of the cream in a tub in the fridge to eat with a spoon in the middle of the night. You could of course just make less of it, but where’s the fun in that? Thank you, my cooking isn’t always successful, so I’m pleased when it works out well! I know right! After we stopped filming, I had a go too just picking up the yolks and popping them back out! They seem a lot less fragile doing it this way. Those look fantastic! And isn’t that egg separation trick cool? I saw that a while back and thought I’d give it a try the next time I needed the white and the yolk separate. Glad to see it works. Yes, I wanted to try the egg separation trick right away! I think the size of the bottle opening is quite important because when we did the fourth egg that isn’t on film, the yolk was smaller than the other three and it kept falling back out too easily! Carrie I’m shocked! 😉 Plus, re-reading what I wrote about the size of the bottle, I realise it all sounds rather smutty! Holy moly. I’ve never seen that egg separation trick. Can’t wait to try it. Wish my mother was around. She’d love this. Your meringues are so glossy, Vanessa. I reached up to grab one and broke a nail on my laptop screen. Ha ha. I know, it’s worth deliberately doing a recipe that involves separating eggs just to try it, like I did! I would save you a meringue, but it’s too late! You won’t believe this but after reading your post, got an e-mail with a video attached, showing how this is done. Awesome. How funny! That’s often the way isn’t it. Still, I think this is an awesome ‘trick’. Aha! I love that method of separating the eggs! Fantastic. I feel like cooking something, anything JUST to try that egg separating! Yes, I’ve always thought of meringues as little fluffy heavenly clouds! I’ve never seen that bottle trick for separating eggs, but what a neat idea! When I make eggnog, I have to separate a dozen eggs, and I do it the old-fashioned way. Next Christmas, maybe I’ll try the bottle! Lovely meringues, by the way! Yes, try the bottle method, I often end up breaking the yolk with the traditional method, so I love this! That bottle method looks like a fun excuse to separate eggs. 🙂 I probably shouldn’t admit that I’m not all that fond of meringues for some reason. But yours looked tempting! It’s ok, you can admit it, not everybody has to like meringues, I mean I don’t understand WHY they don’t, but I accept that’s the case!